CARFAX One-Owner. Clean CARFAX. 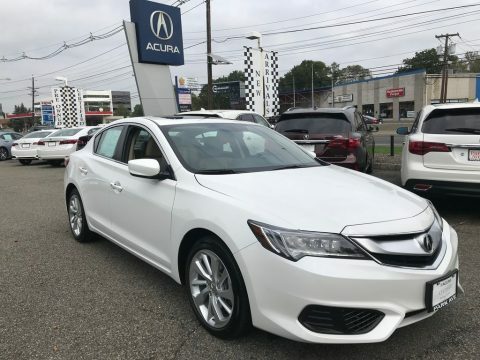 2017 Acura ILX Premium Package Bellanova White Pearl FWD 25/35 City/Highway MPG **We list our best price online and in fact most vehicles are priced below average market value. **, **NO BS! !, We don't charge a Prep fee, Certification fee, or extra for not financing with us. **, ** Acura Certified! **, *www.parkaveacura.com*, *Bluetooth, Hands-Free*, Fully Serviced and Reconditioned, *2 Sets of Keys*, AM/FM radio: SiriusXM, Blind spot sensor: warning, Exterior Parking Camera Rear, Perforated Leather-Trimmed Interior, Power moonroof, Speed-Sensitive Wipers. Acura Certified Pre-Owned Details: * Vehicle History * Powertrain Limited Warranty: 84 Month/100,000 Mile (whichever comes first) from original in-service date * 182 Point Inspection * Transferable Warranty * Warranty Deductible: $0 * Limited Warranty: 12 Month/12,000 Mile (whichever comes first) after new car warranty expires or from certified purchase date * Roadside Assistance * Includes Trip Interruption and Concierge Services Awards: * 2017 IIHS Top Safety Pick (When equipped with optional front crash protection) * 2017 KBB.com 5-Year Cost to Own Awards 2016 Kelley Blue Book Brand Image Awards are based on the Brand Watch(tm) study from Kelley Blue Book Market Intelligence. Award calculated among non-luxury shoppers. For more information, visit www.kbb.com. Kelley Blue Book is a registered trademark of Kelley Blue Book Co., Inc. *Insurance Institute for Highway Safety. #1 Rated Acura Dealer in NJ by DealerRater.com for 2012, 2013, 2014, 2015, 2016, 2017 and 2018 United States Acura Dealer of the Year! Any and all trades will be accepted. Only accept Acura's 182 point inspection Certification from authorized Dealers. A Free CARFAX & Kelly Blue Book report is available. We have been selling quality Pre-Owned Vehicles to Satisfied Buyers in the Tri-State area for over 38 years. Stop by or call us at Park Ave Acura for more details 201-587-9000 or email us at sales@parkaveacura.Com.